The city of culture continues to impress with the vast array of quality exhibitions. Spring is divine in Melbourne; the cold weather begins to disappear and Melbourne has some great events and exhibitions for the warmer months. 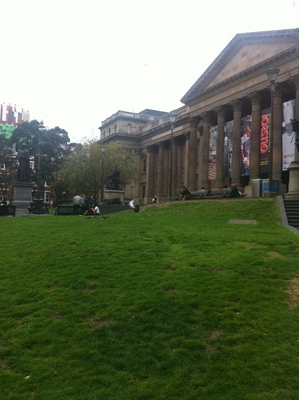 One of these exhibitions gives visitors and locals to Melbourne free entry, while the other two are about to end, yet reasonable entry rates are obtained. The first exhibition has to be the creme de la creme (sorry bad pun) of all exhibitions in Melbourne. This particular exhibition has really proven how far Melbourne has come. You will begin to develop a greater appreciation for all things gastronomic. This exhibition started only days after I moved to Sydney from Melbourne. Therefore, last weekend was my only opportunity to experience and see what all the culinary fuss is about. The history of Melbourne's food is incredible. The influx of different migrants has brought a high quality facade of Asian and European foods into Melbourne. The basic staple diet was all that Melbourne could handle initially. After visiting this free exhibition on at the State Library of Victoria, you will begin to appreciate why Melbourne is the food capital of Australia. Some of the country's leading culinary icons are highlighted. Food has become fashionable in Australia, especially in Melbourne. Despite many restaurant closures and higher meal prices, more and more Victorians are eating out. On the other hand, eating out has never been so affordable in Melbourne. At this exhibition, you will get it. A simple pizza recipe for the kids is also available to collect. Come to think of it, it was interesting to learn at this exhibition that The Age Cheap Eats guide for 2012 contains over 500 restaurant reviews. Incredible. The imagery and the collection of old cookbooks for show and tell is just stunning. This exhibition will be around until the 28th of April 2013. Further information on this exhibition can be found by clicking here. Sonic the Hedgehog has never been so in vogue since the 1990's. At this exhibition held at the Australian Centre for the Moving Image (ACMI) the computer games world is truly your Fed Square and Melbourne oyster. There are over 125 games, playable games on show. The most influential game designers, think Nintendo and Sega are featured. All things computer games and high tech is just incredible. Give Timezone and those arcades a bit of a break for now. Your chance to experience until the 28th of October 2012. Further information on this exhibition can be found by clicking here. The story of Napoleon Bonaparte, one of the world's most powerful visionary rulers is deigned in an art story at NGV International on St Kilda Road. Your chance to experience many different artistic treasures at this exhibition from furniture, sculpture, gold, silver, porcelain, textiles, fashion, jewellery and of course paintings. On until the 7th of October 2012. Further information on this art magic can be found here. With the above two exhibitions, a 20% discount is enjoyed on joint tickets. The best of art, culture and food. That is marvellous Melbourne indeed. When: From now. Two exhibitions finish next month, while one is on about April 2013.